I found this site on Reddit today. 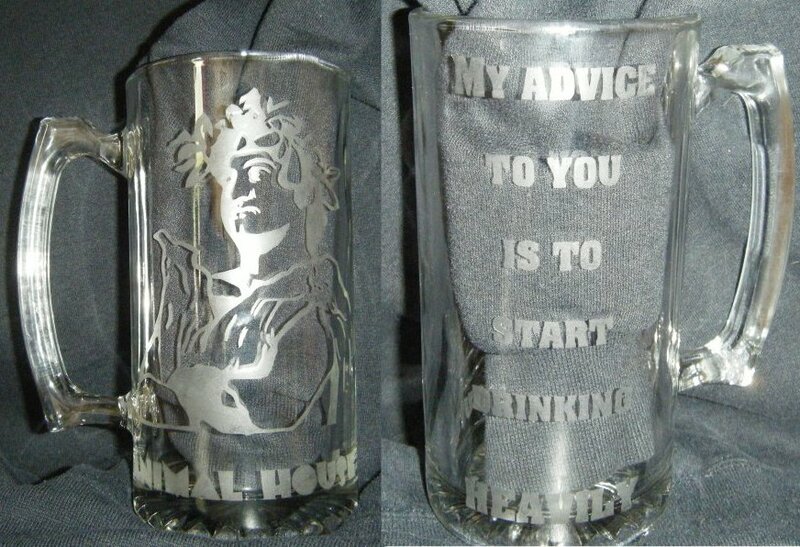 This guy (his name is Sean) makes custom glass etchings, and I must say some of them are pretty cool. His website, which he apologizes for up front, shows some of his handy work. He seems to be quite talented and could make some great custom barware for you. If you have an opportunity head on over to Kicking Glass and see what he has to offer. I’m thinking a nice pilsner glass with the Beer and Whiskey Brothers logo on it would be the cats meow. Maybe I’ll even get something for Jim this Christmas, along with last years Christmas Present that I still have for him, oh and his camera tripod that has been under my stairs now for over a year. Maybe…NAAAHHH! ← Can Hype Ruin a Beer? Don – we actually met briefly this year, at the Laughing Dog beer & chocolate pairing at Brewforia! Wow Sean, are you local to Boise? I’d love to talk to you about some of your etchings. Idaho- the land of shattered dreams and potatoes.